SNES Lucky Luke (Europe) in 24:36.51 by TASeditor. 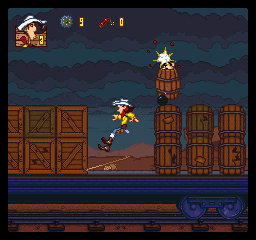 Lucky Luke for SNES is based on a comic book series popular in Europe. The eponymous cowboy has to arrest four of the Dalton brothers – Averell, William, Jack, and Joe. On his mission, he makes his way through various locations shooting bad guys and collecting useful items. In each area, he must complete an objective such as freeing a Bank Director or collecting the necessary number of items in order to progress. There are also some autoscrolling sections where he chases after one of the Dalton brothers or hurries to avoid certain death. In this run, TASeditor runs, jumps, and climbs through the game, completing it in under 25 minutes.